Along with 2 restaurants, this smoke-free hotel has a full-service spa and an outdoor pool. Free WiFi in public areas and a free airport shuttle are also provided. Additionally, a 24-hour fitness center, a bar/lounge, and a poolside bar are onsite. All 442 rooms boast deep soaking tubs and offer free WiFi and 24-hour room service. Free wired Internet and minibars are standard, as are TVs with satellite channels. In addition to a full-service spa, Sama-Sama Hotel, KL International Airport features an outdoor tennis court and an outdoor pool. Dining is available at one of the hotel's 2 restaurants and guests can grab coffee at the coffee shop/café. The property also has a grocery/convenience store. Guests can unwind with a drink at one of the hotel's bars, which include a poolside bar and a bar/lounge. A computer station is located on site and wireless Internet access is complimentary. Business-related amenities at this 4.5-star property consist of a business center and limo/town car service. This luxury hotel also offers a children's pool, a spa tub, and a 24-hour fitness center. A roundtrip airport shuttle is complimentary to guests (available on request). Parking is available onsite for a surcharge. Sama-Sama Hotel, KL International Airport is a smoke-free property. Degrees - This restaurant serves breakfast, lunch, and dinner. Open 24 hours. Travellers Bar And Grill - This tapas bar serves dinner only. Guests can enjoy drinks at the bar. Palmz Lounge - Overlooking the garden, this restaurant serves breakfast, lunch, and dinner. An outdoor pool, a children's pool, and a spa tub are on site. Other recreational amenities include an outdoor tennis court and a 24-hour fitness center. Guests can indulge in a pampering treatment at the hotel's full-service spa. Services include facials, body treatments, and manicures and pedicures. The spa is equipped with a sauna and a spa tub. Airport shuttle service is available on request from 6 AM to 2 PM. Fees may apply. Contact the property in advance to make arrangements. 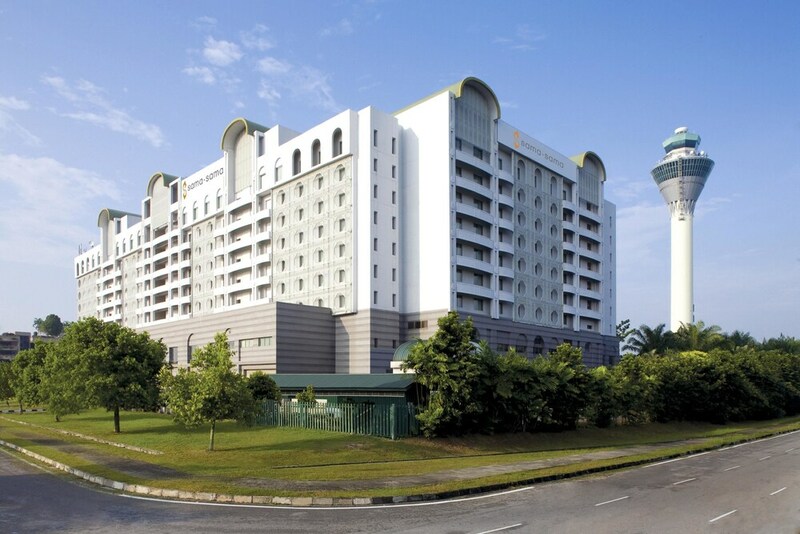 Please note: this property is located adjacent to the KL International Airport. Travelers can reach the property via the sky bridge that links the airport to the hotel. This property provides a shuttle service to Kuala Lumpur International Airport 2 (KLIA2), available on first-come-first-served basis only. For more details, please contact the property using the information on the reservation confirmation received after booking. Please note that children under 13 years old must be accompanied by parents or guardian in the Club Lounge. For more details, please contact the property using the information on the reservation confirmation received after booking.